22.08.2011: Ford Fiesta S2000 driver Ott Tänak has clawed himself back into S-WRC title contention after a stunning performance at ADAC Rallye Deutschland this weekend. Ford Fiesta S2000 driver Ott Tänak has clawed himself back into S-WRC title contention after a stunning performance at ADAC Rallye Deutschland this weekend. The Estonian driver led the S-WRC at the end of the first day and finished a remarkable five minutes and 38.6 seconds ahead of his closest competitor - fellow Ford Fiesta S2000 driver Nasser Al-Attiyah. Frigyes Turán completes the podium clean sweep for Ford with his second third place finish of the year in the Fiesta S2000. Tänak’s victory at the first asphalt rally of the season has now promoted the 23-year-old to second in the overall championship standings. He also slashed Juho Hanninen’s lead in S-WRC to just 18 points, thus creating an exciting battle during the championship’s closing three rounds. Martin Prokop’s hopes for a second victory in S-WRC were dashed after an incident on Friday’s closing stage. Despite setting eight fastest stage times on the second day, the time lost on Friday proved too much for Prokop to catch and the Czech driver had to settle with sixth place. Portugal’s Bernardo Sousa was lying sixth until he was knocked back to eighth after an incident saw him go off the road on the rally’s penultimate stage. Wildcard entrant Felix Herbold battled back from an early retirement to finish his debut S-WRC event ninth. 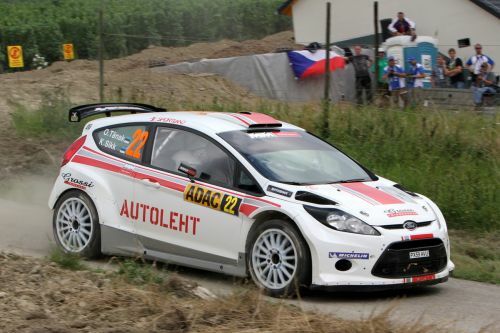 Markko Märtin’s protégé Ott Tänak racked up four fastest stage times including a sixth fastest overall stage time on ADAC Rally Deutschland’s opening day. At the end of the first day, the young driver was leading S-WRC and placed 13th overall. As the S-WRC competitors journeyed to the Baumholder region for the second day of competition, Tänak enjoyed a relatively trouble-free day to lead the S-WRC by a remarkable four minutes going into the final day. With no immediate threat from behind, Tänak adopted a cautious driving approach for the day’s closing five stages to consolidate his second S-WRC victory of the season. This weekend’s victory has successfully promoted the former Pirelli Star Driver up to second in the championship standings, 18 points adrift of Hanninen. “It’s been a really good weekend – I’ve made no mistakes and the car has been perfect. After Saturday morning I didn’t need to push so I just started to enjoy myself. I didn’t want to risk losing my position so I didn’t overdo it – it was a nice position to be in as there was no pressure providing we had no problems with the car. Reigning Dakar Rally champion Nasser Al-Attiyah was third in S-WRC at the end of Friday’s stages, despite losing time when fellow Ford Fiesta S2000 Bernardo Sousa had an incident during Stage 3. At the end of Stage 6, Al-Attiyah was 9.3 seconds behind Karl Kruuda in second position and 18th overall. Al-Attiyah lost second gear on Saturday’s opening stage but his team performed a gearbox change at the midday service and the driver moved up to second in S-WRC at the end of the day. Sunday posed no problems for Al-Attiyah who was competing at Rallye Deutschland for the first time this weekend and the driver finished with his best result in this year’s S-WRC so far. Frigyes Turán’s rally got off to a shaky start when the Hungarian went off the road on the event’s opening stage. The driver lost four minutes as a result and brake issues also hindered his progress on Stage 2. At the end of the first day, Turán held fifth in S-WRC and he was placed 27th overall. Turán had a relatively trouble-free second day despite having to complete the lengthy second Arena Panzerplatte stage with no power steering on his Fiesta. The driver clawed himself up to third in S-WRC when his competitors fell by the wayside on the treacherous stages in the notoriously difficult Baumholder military region. Power steering issues persisted for Turán during Sunday opening stages followed by a front left puncture on the final stage but the driver pulled into the final service at the rally base in Trier delighted with his second podium in S-WRC this year. Martin Prokop led after ADAC Rallye Deutschland’s opening stage in his Ford Fiesta S2000 but suffered a crash three kilometres into Stage 8, ripping a wheel off his car in the process. Prokop returned to the second day of competition under SupeRally regulations on flying form and posted an incredible eight fastest stages to hold seventh overnight. On Stage 15, Prokop lost time when he hit a barrier and suffered a puncture. Despite these problems, the former J-WRC champion made it to the end of a difficult rally with eight championship points. Prokop is now third in the S-WRC standings, four points adrift of Tänak. Portugal’s Bernardo Sousa damaged the right-hand side of his Ford Fiesta S2000 five kilometres into Stage 3. The 24-year-old was forced to retire for the day after an incident on the day’s final stage. He held eighth in S-WRC overnight. Saturday fared better for Sousa. The young driver had a small off when he overshot a junction on Stage 10 but the driver managed to climb the leaderboard to finish sixth in S-WRC at the end of the first day. Three kilometres into the event’s penultimate stage, Sousa went off the road and damaged a wheel and incurred a puncture. The Madeira-based driver needed assistance to get back on the road and suffered significant time loss but Sousa nursed his Fiesta S2000 to the end of a troubled rally. German wildcard entrant Felix Herbold had a strong start to ADAC Rallye Deutschland and was lying fourth (19th overall) at the end of the first day of competition, only 7.5 seconds behind fellow Fiesta S2000 driver Nasser Al-Attiyah. Herbold’s charge for a podium in S-WRC was abruptly ended on Day 2 when he tore the front left wheel off his Ford Fiesta S2000 on Stage 7. Herbold returned to today’s rally under SupeRally regulations and had a relatively trouble-free day to finish his debut S-WRC event ninth and 39th overall. Day one ended with the MINI WRC Team in a very encouraging fourth and fifth overall.